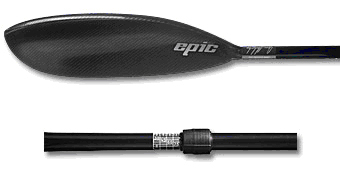 home >> kit report >> Epic Wing paddles. Before reading this report the reader must be aware that I am selling these paddles. I have tried to be as objective as possible but have to stress that the opinions given in any of the tests on this site are all personal and as with any kit/equipment there will always be other valid opinions out there. To date I have been using the Epic Mid wing and the Epic Mid-Large wing. Throughout my own paddling career I used the Lettmann Nordic wing paddle. If I shaved about 10mm off the leading edge they were pretty well balanced in the water, and for me better than any of the other paddles available at the time. I have tried all the paddles at some time or another and always reverted to the Lettmann. I am not an equipment freak and do not like change for the sake of fashion. With paddles above all else functionality is the key. So what are the Epic paddles like? The first thing that strikes you is how lightweight the paddles are, certainly compared to the Lettmann which is on the heavy side. Personally I think the weight is pretty irrelevant once you are using them in anger but would think for the casual cruiser this could be a real bonus. The blades are very rigid on the full carbon models I tested which is a real plus and the tips are very fine giving a great entry into the water without being too fragile for those inevitable contacts with the bottom of the river. A solid knock on the rocks though still damaged the tip but the damage remained very localised and has not led to fraying or splaying. The paddles are all split shaft and have a “Length-Lock” system which allows adjustments to both length and angle to suit the individual. Great if the paddles are dual purpose as mine are. 212cm for surf ski and 220 for flatwater. The “Length-Lock” system on the models I used was a sleeve with a screw collar locking system which is now obsolete for the obvious reason that it did not quite tighten enough to hold your settings if applying high power and also the twisting of the lock eventually loosened the collar on the shaft. Having reglued both of mine they are now working perfectly. The factory assure me that the new design which locks with a cam type fixing addresses both these issues. I will add new information to this write up when I get the new batch in. The adjustability I have already covered and this is a great bonus not only for the paddler in different events but for the parent with a growing child! With a 10cm adjustment available one paddle will pretty much be enough to cope with any growth your offspring can manage. Another great feature is the shaft under your hands is slightly oval giving you a very positive feel for when the paddle is at the right angle. For me there are two times when this is a real bonus. Firstly on starts so you know the paddle is at the right angle relative to your hand and secondly at the other end of the race when the forearms are gone and the jelly arms kick in. You still have the confidence to pull hard knowing your hands are still in the right place. This may be just a personal thing to me of course. In the overall scheme of paddle buying these are just preference issues. The real bonus and real selling point of these paddles is how well the blade is balanced. As soon as the blade enters the water it is stable and fixed, all you have to do is pull hard. 3) Length/ angle adjustment is very useful. 1) I need to test the new “Length-Lock” system the old one is ok for touring or marathon paddling but full on sprinting tests its limits. Fingers crossed. These are the best balanced paddle I have ever used, after 20 plus years trying all the others and settling for the Lettmann which had to be trimmed down to balance it I now use a paddle which has got it right. Paddle purchases should always be based on what suits you but these are definitely worth a look. A well made paddle with great functionality. If anyone out there has any items they would like us to run a test and report on please contact us through the site.